Heirloom-quality craftsmanship meets the need for modern speed at The Urban Electric Co.
(Clockwise from top left) A craftsman at work in the enterprise’s North Charleston headquarters; Dave Dawson, who founded The Urban Electric Co. in 2003; The “Rex” table lamp; and “Globus” pendants in a kitchen designed by Jennifer Langston. One answer: speed up. Urban Electric launched a Quick Ship program in 2013, “But since we believe in infinite options—30 different metal finishes, thousands of paint and powder choices, and so on—these pieces are still made-to-order,” notes Dawson. “That’s a hard trick to pull off because every day, we wake up to a whole new order file.” Five years in, nearly half of their fixtures can be ready for delivery in two to four weeks. The design process has revved up, too. “We historically introduced about 15 lights once a year. Now, we’re working toward one new product per week,” Dawson says. “It keeps a sense of excitement going—if you haven’t been on our website in a month or two, you’ve missed a lot.” A redesigned www.urbanelectricco.com launches later this summer, and beginning this fall, clients can virtually configure their own pieces and—for the first time ever—purchase them online. With offices opening soon in Chicago and London, we can only wonder, what will the next 15 bring? 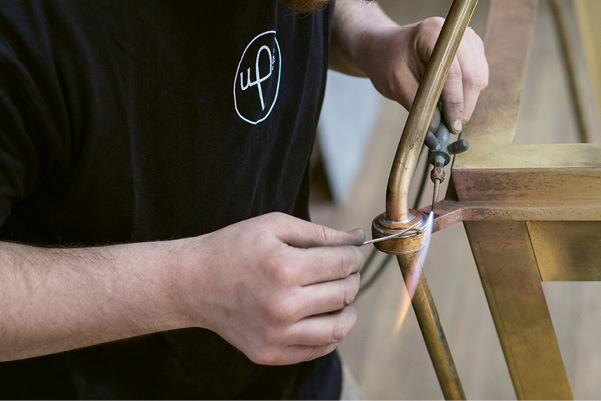 Each fixture is made to order. ➼ In the past year, The Urban Electric Co. has shipped to 30-plus countries, including Australia, France, and Singapore. ➼ After a Chicago outpost opens in September, the enterprise will have 5 FLEET offices in the United States. They act as private receiving and inspection warehouses, as well as home base for a white-glove delivery service. ➼ Its 1st international creative studio debuts in London this fall. ➼ New hires are trained in an 8-stage apprenticeship program that currently includes 110 apprentices. Photographs (5) courtesy of The Urban Electric Co.